Cibi (a Japanese word meaning 'a little one') covers home-style Japanese fusion cooking, with over 80 seasonal recipes for vegetables, fish, seafood, meat, grains and noodles and desserts. Marrying traditional Japanese techniques and flavours with Western produce, like a Japanese caprese salad, or Baked miso eggs with roasted eggplant and pumpkin, the food in Cibi is simple and healthy. The recipes are designed for family meals, adhering to the Japanese 'home-style' cooking philosophy of having a number of plates to share with a focus on vegetables alongside a meat dish. For a Japanese-style breakfast, you could try the Cibi Egg and potato salad, Ginger and spinach ae-mono (dressed vegetables), and Cabbage and corn okonomi-yaki, with salmon and perfectly cooked rice. Accompanied by beautiful photography and illustrations, the recipes also feature breakouts on elements of Japanese cooking and food culture. 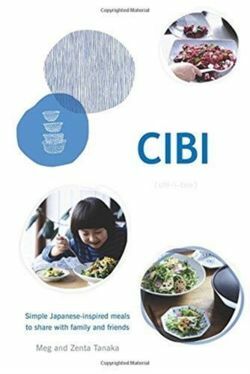 Inspired by Japanese design culture, Cibi provides endless inspiration for healthy family feasts.